GWU Smith Center in Washington DC, hosted event number 3 of the 2018, inaugural season of the Pro Fighters League. 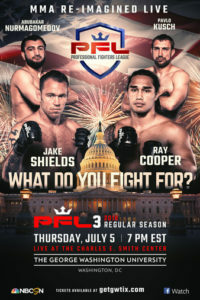 This event features the Middleweight & Welterweight divisions, with former Strikeforce champion Jake Shields against Ray “Braddah” Cooper III. The card also includes UFC vets Borjan Velickovic, Danillo Villefort, Joao Zeferino, John Howard, Rick Story, Yuri Villefort, Gasan Umalatov, & Eddie Gordon. Also Bruno Santos and Paul Bradley, who fought for the UFC & Bellator MMA, and Bellator vet Herman Terrado.